The 5th century BC krater, a special vessel for mixing wine (and water), which has recently been confiscated from a treasure hunter by the Bulgarian police, was made in Ancient Greece during the Age of Pericles, part of the Golden Age of Athens, Bulgarian archaeologists have concluded. Following a more thorough examination, the Bulgarian archaeologists are positive that the krater is an original produced in one of the Ancient Greek cities, possibly in ancient Athens, and is not a replica made by some of the neighboring peoples such as the Ancient Thracians, reports the Bulgarian daily Monitor. The archaeologists who examined the vessel are quoted as saying that original Ancient Greek kraters are rarely discovery in Bulgaria, primarily in the tombs of the Ancient Thracian kings, and not in all of them. The krater in question was produced following an Ancient Greek decoration style known as red-figure pottery, which was in use between the 6th and the 3rd century BC. Red-figure ceramics were produced primarily on the Attica Peninsula as well as in Southern Italy and Etruria. In it, red figural depictions were painted on a black background unlike the preceding Ancient Greek pottery decoration style, black-figure pottery, where black figures were painted on a red background. The Ancient Greek krater confiscated from the 33-year-old Bulgarian treasure hunter, whose name is Georgi Tihlev, a native of the southern town of Susam, Haskovo District, could be worth hundreds of thousands of euro for collectors. However, the treasure hunter described in the report as “ignorant” broke the vessel into pieces at the time of its discovery, and later had it glued back together rather incompetently meaning that he would have received much less money if he had managed to sell it to antique traffickers. Unfortunately, the botched restoration of the krater has damaged irreparably some of the paintings on it. The 33-year-old man has told the police that he found the Ancient Greek crater in the area around his hometown in Southern Bulgaria where he has been looking for coins and metal antiques from archaeological sites – one of the tens or possibly even hundreds of thousands of treasure hunters looting Bulgaria’s history and cultural heritage. The Thracian tumuli (burial mounds) dotting Bulgaria’s landscape come very often under attack by ruthless treasure hunting looters, among many other archaeological sites and structures. The report points out that Georgi Tihlev hardly goes treasure hunting out of want since he runs a profitable family business with a farm with over 100 cows. Ancient Greek red-figure pottery was a style of Ancient Greek ceramics decoration, which developed at the end of the 6th century BC, and was in use till the end of the 3rd century BC. It was based on painting red figural depictions on a black background unlike the preceding Ancient Greek pottery decoration style, black–figure pottery, where black figures were painted on a red background. Important areas of production of red-figure ceramics were Attica, Southern Italy, and Etruria. Ancient Greek red-figure vessels often featuring motifs from the Greek mythology were exported in the ancient world, including to Ancient Thrace. 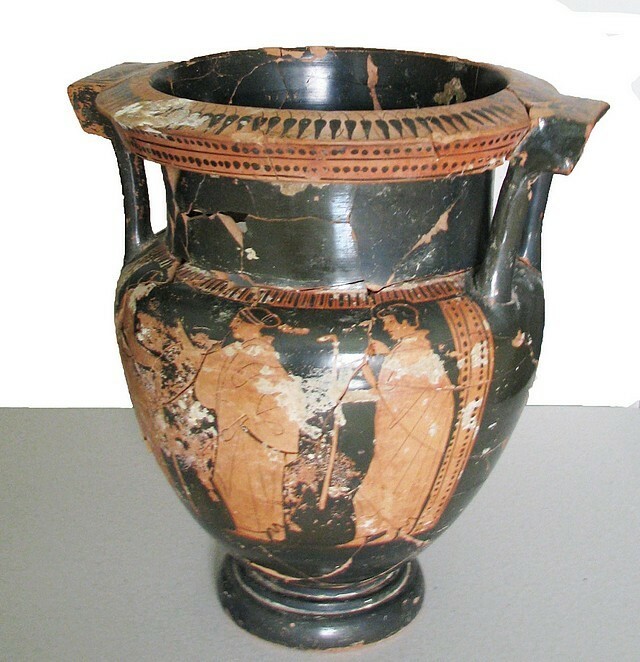 In Bulgaria, Ancient Greek red-figure vessels such as kraters have been found in some tombs of Ancient Thracian Kings.